I’ve searched through glens and dales for years for the perfect patio furniture. and walked out with the most fabulous patio furniture anyone could shake a shillelagh at. It was like finding the elusive four leaf clover when I scored my vintage porch glider at an estate sale. And the heavens parted once again with this $15 marble topped mid-century table found at the Nun’s Yard Sale! 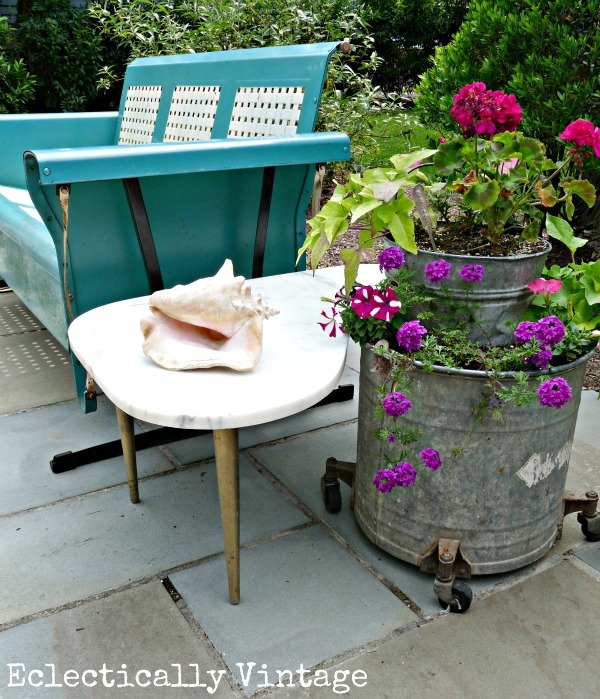 Another one of my vintage mop buckets – this one rocking and rolling on casters! (yes, he now thinks I have issues)! May the luck of the Irish be with you on your thrifting journeys. « Previous: How Do Your Pesto & Mojitos Grow? WOW! that furniture is from HD??? love. … and loving that you sashay through Home Depot! Kelly, the glider white woven inset looks great with your open weave patio furniture and the old container planters bring it all together! Ha!..Pati O…I have to use that line! !…OK…I have not been in Home Depot for ages…Lowes is closer to me…I am ecstatic over that furniture….like over the top…have to have it….I look at places like Summer Classics for patio furniture that resembles actual furnishings for the inside…OK..I am getting dressed and walking out the door!!! Kelly, this is such a fabulous space. I wish we had added a patio below the deck. Love all the vintage touches along with your furniture finds. I’ve NEVER seen anything like that at Home Depot! Totally classic, I love it! Your glider is the perfect piece to add something fun in the mix! Your patio looks fabulous!! I got to move to your area! You get to find the most amazing vintage finds and now not just vintage!! That patty O furniture is great!! Oh, I saw that set at Home Depot also and I fell in love with it. Unfortunately, I’ll have to love it from afar because I already have some porch furniture and I can’t divorce it yet. Your patio looks lovely! Well I’m Irish and so far it hasn’t helped me pull a nice patio area together. But that was before I had all this blogging guidance. Maybe this is the year? I saw that set at my Home Depot and had to restrain myself. All of it looks gorgeous!! I love your mop bucket turned planters, but the best is the container for Tea Leaves. My neighbors have known for years I have junque issues. They eventually stop looking at you strangely and start giving you their junk! Good thing I just swallowed my sip of coffee instead of spraying it on the screen! Boy, do I appreciate a laugh! After we finished our deck last year, I ran to 3 different Targets (all in different cities over 1 hour away in different directions) to get my patio furniture on clearance. Dang it…now I wish I’d waited! Love your furniture! I absolutely love your mix of of vintage and mod. All your pieces are just so fantastic. The Home Depot stuff looks classic and fits in perfectly. I struggle with mixing styles – this inspired me to continue to be true to my own likes! 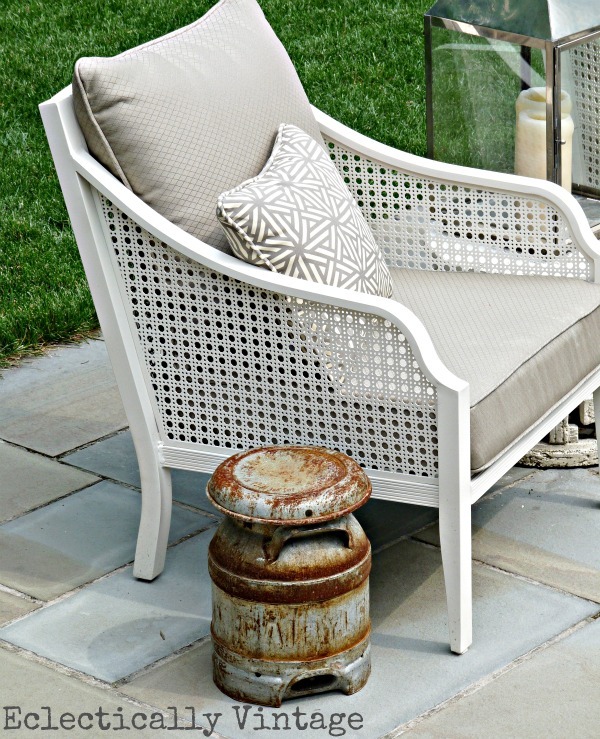 I stopped at looked at that set for a long time – it is really beautiful and works perfectly on your patio! Love that furniture Kelly, I can’t believe it’s from Home Depot and the price is amazing! Love the mop buckets…my guy owns a janitorial company. Wonder if he has any old mop buckets around, instead of the bright yellow plastic ones. I linked up too to Southern Hospitality you can see our cabin porch here http://homastyle.com/wp/?p=2918. I love the new set, and they go so well with the glider and the rockin’ planter-dresser! Beautiful furniture and a great “bargoon”. It looks so inviting. holy creative, Batman!! Stopped by from Hating Martha!! New follower and totally inspired!! I love it! I just bought new patio furniture too, and I like what I bought, but if I had seen this I would have snapped it up too. Good work! Lovely patio. Yowzer! I love that furniture. Hope they still have some when i venture that way tomorrow. Also, your glider looks fabulous! Just wanted to thank you for linking up today @homastyle. I love the furniture but what you have your plants in caught my eye. Very cool they look so beautiful. I always get such a giggle from that joke… Your patty o’furniture is really pretty. Nice find and it’s great that you got the refund. 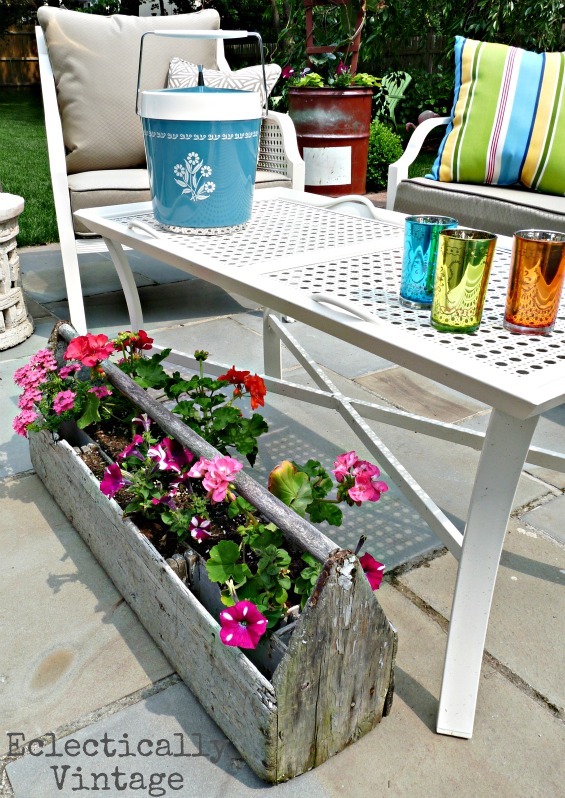 The mop bucket planter is a great idea with the wheels…easy to move around. Deeeeee-licious! You wouldn’t be able to peel me up off of that patio..
Dude! You rocked that furniture! It is GORGEOUS_ it looks nice enough to be indoor, I think! Way to go, chica! Although, I have to say, my favorite part was you saving an extra 4 big ones!! Most excellent shopping I’d say! Your outdoor patio furniture rocks. Great deal after the credit! Your yard and flowers are looking quite lovely too Kelly! Well I still hate you just a little bit for finding that glider. Love the color of that. My Home Depot did NOT have that furniture! I can see why you fell in love. Great post at Hating Martha! I saw you on Treasure Hunt Thursday. As said before these are great!! Kelly, you amaze me with your creativity! 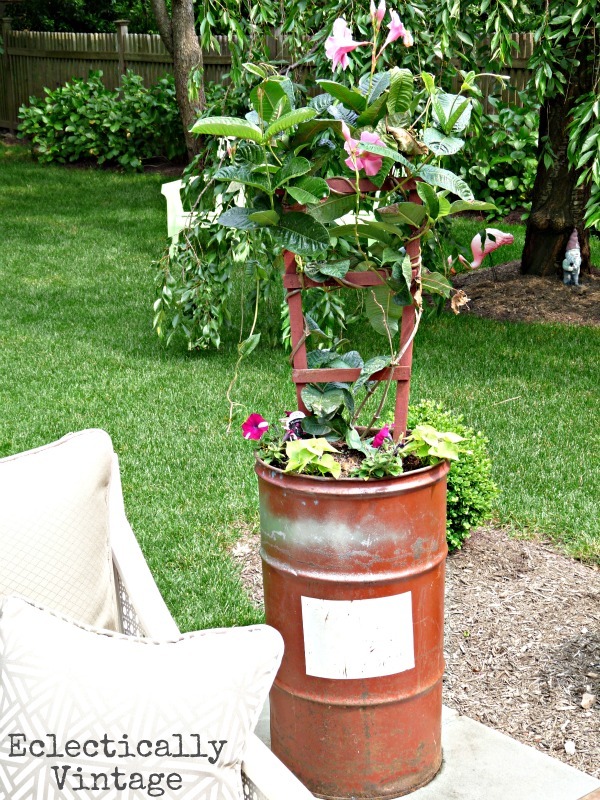 I would have never thought of a vintage mop bucket for a planter. Love your patio and all the furniture. Your play on words is funny too! Love, love, love the vintage glider! You mix things up so well. Your patio has it going on! What will you find next? Look at you getting that credit! You know how to work the deals and the cool stuff. Love it all! love this outdoor retreat! my fav is the turquoise glider… i’ve been dying to find one of those! cute, cute! it’s absolutely beautiful, all of it! great job. And the glider is perfect! Your furniture is beautiful. How lucky to get money back. I love your mop bucket. 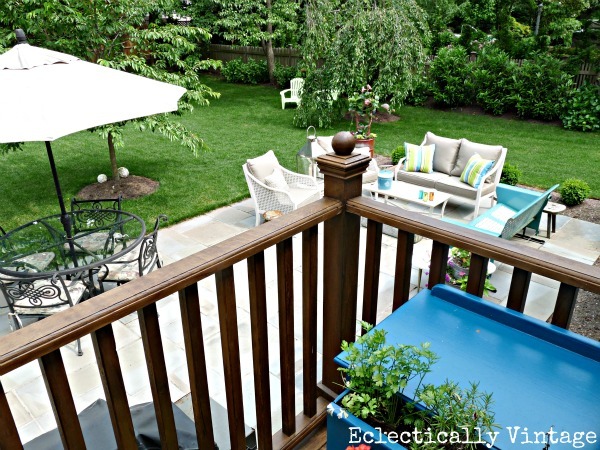 Love your outdoor living space. I specially love your plant containers, the metal ones and the wooden box. Your Patty’O looks so inviting! I want to curl up with a book on that amazing furniture you got! I love the contrast between the old and the new, and how seamlessly it goes together! Very Cute! Love the glider. I will check for this patio set at Hoe Depot here! Score! Love this. Would live it if you shared it at my furniture party http://www.decoratinginsanity.com/2012/06/hello-party-people.html. Love your site, am a new follower. So, so, so awesome!!! I think you and I could be junk buddies. I think we both decorate with mostly other people’s junk. It looks so fantastic! I’m loving the patio too! great looking patio!!! so much to look at! I love this!!! Everything looks so inviting. The furniture looks great!! Hey – you have lots of fun “junk” too! :o) LOVE the mop bucket. Your patio is fabulous!! I love the mix of new with the vintage. That glider is awesome, and your planters add so much charm. shilelegh…haven’t hear that word in a while, nor do i think i’ve ever seen it spelled…obviously, lol. what a great find on that furniture, and good for you for going and getting half your money back! that’s awesome! I must sashay right on over to my HD and see about this furniture. Your patio is perfection! I just let a two seater glider slip away from me at an auction … I’ve not be the same since. I love yours. I love it. I’m big into outdoor spaces. Thanks for sharing your terrific finds. Beautiful! Love all of the vintage additions. Thank you for joining me at Home Sweet Home! I will be featuring your post in tonight’s party post! I love it all. That bop bucket is way cool! I am sure that you already know this from all of the comments that you’ve received but…you’ve done a beautiful job! I’m pinning this for future inspiration! Gorgeous! Love all the pretty details and your new patio set too! Thanks for linking up to Share the Love Wednesday! You’re featured this week–stop by and grab a feature button when you have a chance. 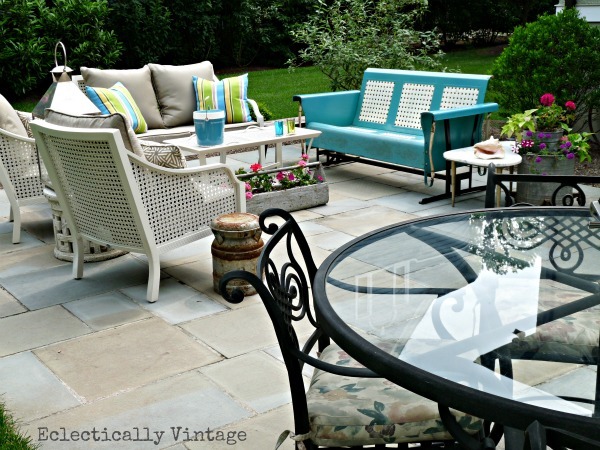 Love the patio set….could tell me the name of the set? 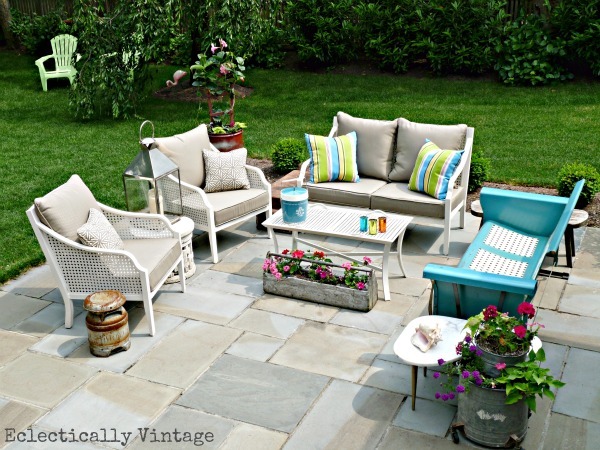 Just love your yard .. your patio furniture and everything. Wonder if I could fit that patio furniture on my front porch. Need to run to HD. I have containers … just need to find some plants the deer do not like. Thanks for sharing your lovely back yard. I wish I had seen this post years ago when you bought the patio furniture. Do you remember the exact name of the set? I want to try and find it online somewhere, I am IN LOVE! No I don’t know exact name I just know it’s Martha Stewart for Home Depot – good luck Karissa! Love your inspirational ideas, Oh, and your beautiful mind. It just makes me wish I lived close to you so we could hang out, plan strategies and make cool adult beverages. I like the idea of planning sale runs. There is a garage sale that goes from the outskirts of town all the way to the coast each summer. So much fun! Happy Hunting. Can you remember the name of the range that this furniture is part of? I love it but I don’t think they sell it anymore.